Thanks. I'll leave the LEDs on 24/7 and watch what happens. The water in this tank still has an odor, a lot like poop. So I cleaned the sponge again today and changed 3 gallons of water while syphoning out debris from the bottom. I did a good job of it. Most of the odor is gone, but not all. Tomorrow, if the odor remains and/or is worse than today, I plan to pull one of the drops and clean it thoroughly and the other one on Wednesday. Yes, I know this will set back the algae growth but if the odor is not coming from the sponge, it's coming from one or both drops. There's nothing else in the tank but the fish and a couple of apple snails. I clean debris from the bottom every day with a pipette, so there's nothing building up on the bottom. I'll do water changes to keep nutrients fairly low until the algae grows back. The left set of photos (drop #1) were done on Wednesday, the right set (drop #2) today. I'm dropping back to once a month water params only. Not much is happening here, so I don't see much point in weekly reports any more. Both drops are currently in the gourami tank. Both drops are producing lots of algae each week. There is also a sponge filter in this tank. The sponge is apparently cycling as per the Nitrates. Nitrates are too high for the gouramis. I neglected to make water tests daily for a couple of weeks, so I didn't notice the Nitrate rising until Mar08. It had been less than 5.0 at the last test on Feb13, so I didn't think it would rise with all the water changes I've been doing. I have been changing 1 or 2 gallons of water daily in this tank while cleaning debris off the bottom. This is a 15 gallon tank with about 10 gallons of water in it, so obviously, 10% and 20% daily water changes have doodly squat effect on Nitrate levels. After making my water tests yesterday I immediately changed 5 gallons of water. I changed another 2 gallons today and will change another 2 gallons tomorrow. After tomorrow's water change I will make my water test again to verify that Nitrates are down below 5 and if not, change another 2 gallons immediately. In an attempt to get more nutrient removal via algae, today I cleaned one of the drops and put a roughened plastic screen in it to increase surface area. This is the black screen that came with the drop and I cut it down a bit to fit better. I've had it lying around doing nothing until now. When I clean the other drop on Sat. I will put it's screen back in. If algae doesn't want to grow on the black screen, I will replace it with my white plastic canvas. An update on this tank. I'm doing daily 2 gallon water changes since my last report. Even with that amount of water changing, nitrates still rose to 20.0ppm over the course of 3 weeks or so. To get nitrates down for today's test, I changed 8-9 gallons of water today a couple hours before doing the test. So even with both drops growing lots of algae in this tank AND changing 20% of the water DAILY, nitrates still rose significantly over only 3 weeks! I find that really disappointing. There are 6 fish and 2 snails in the tank. I'm hoping the fish stop growing in a month or two more, then maybe I can feed them a bit less. They eat voraciously and produce poop to match. BTW the screens I added to both drops have increased algae growth significantly. So that works well. In addition to the daily water changes I guess I'm going to have change about 5 gallons (50%) once a week. I'm seriously considering trying Nitra Zorb. Anyone have any experience with it to relate? I get rather aggravated by those 'experienced' people on various fish boards who say: "I just do water changes; I don't see any point using the crutch products designed for lazy beginners, etc". I wonder if they ever bother to test for nitrates? My experience over several years is that only massive water changes (75-80+%) done regularly have any effect on nitrates. When you have a situation like I do, where my source water is virtually 100% mineral-free, big water changes just mean I have to add calcium and carbonate back to the water constantly and it's a lot of tedious work to add stuff and measure pH, hardness and calcium repeatedly. I removed the sponge filter yesterday. I also added a small hang-on filter that has a pouch of Algone in it. This was in my main fish tank for the past two months, changing out the pouch with a new one every second week. I just changed it on Friday. So when I put the Nitra Zorb in my fish tank, I figured I might as well move the Algone to this tank until it's expended. Nitrate was up to 5.0 yesterday. After today's 2 gallon water change, nitrate is still 5.0, so I'm hopeful that with the sponge out that's where it stops and will start to go down. Also, there was detectable ammonia today: 0.25. I'm curious how the ammonia goes for the next couple of days. 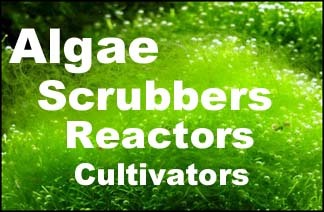 The Algone is supposed to remove ammonia as well as nitrate. Once the nitrate is gone, hopefully the algae in the two drops will start consuming ammonia as well. So, this is to be determined. If ammonia is up again tomorrow I will add Prime. If it continues to rise, I'll have to do a big % water change to knock it back. I removed the Algone about 7 days ago. I put the sponge back for mechanical filtration. The water just gets too full of debris without it. However, to prevent cycling I remove the sponge every 2 or 3 days and sterilize it (hot tap water). So the only biological filtration occurring in this tank is the algae growing in the two drops. I'm still changing 2 gallons of water daily. If the water params remain as they are for the next few weeks or month, I will back off on the water changes and watch what happens. In addition to the 6 gouramis, I put an adult female Chinese Gold Barb in this tank today. She's about the same size as the gouramis and after some initial sniffing and touching, there is no aggression or hostility happening. This particular barb consistently got skin lesions that required removing her from the main fish tank periodically. I suspect that the high nitrate level in that tank is the culprit. So after spending a week in the hospital tank I decided to put her with the gouramis to see if the skin problem stays away. There are 7 other gold barbs in the main fish tank and none of them have a problem with skin lesions. So I presume it's a problem specific to this particular fish. A couple other gold barbs who also had the same issue died in the hospital tank, so this is serious. None of the other fish in that tank have any apparent problems: rosy barbs, Buenos Aires tetras, platys, various corydoras species and the ancistrus male. I need to replace this tank with a bigger one. I'm looking at tanks around 30 gallons and I don't want to be changing 5-10 gallons daily! So I'm hoping the water params stabilize and I can back off on the water changes to weekly or even less. Depends on the nitrates staying at or near 0.0 since the gouramis are so sensitive to it. I wish I had your knowledge of freshwater fish because it would make FW testing easier. For now I just stick to the FW-fish-for-dummies. Oh, I think you're likely getting better advice from your book. I think I've figured out my water change issues with this tank. Today, instead of removing 2 gallons while cleaning the bottom and then replacing it with fresh source water, I siphoned the water through a fine sponge back into the tank. I did this 3 times today, but normally I would only do it once. Each time I lose a little bit of water to the bucket, but that's OK. I'm going to continue this procedure for a week or two and test the tank water every couple of days to see if the params stay good. If this works out, then moving to a bigger tank won't entail big daily water changes, only bottom cleaning and topping up as required.